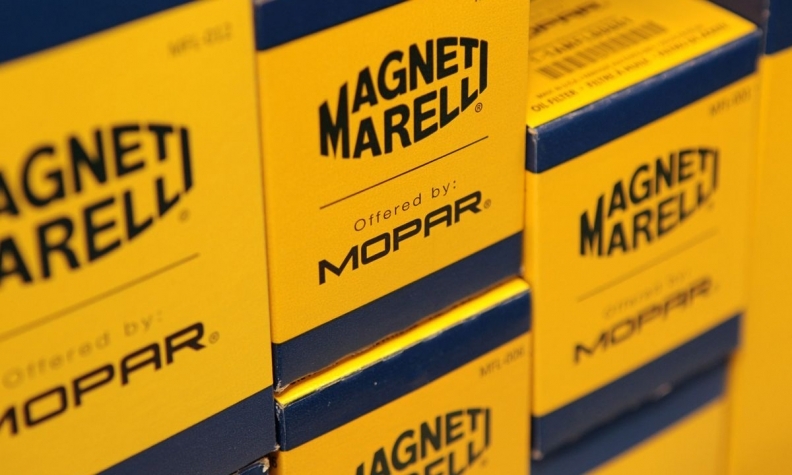 MILAN -- Fiat Chrysler Automobiles is nearing a deal to sell its car-parts unit, Magneti Marelli, to Calsonic Kansei after the Japanese company raised its bid, according to people with knowledge of the talks. Calsonic, an automotive supplier owned by private equity firm KKR & Co., and FCA have reached a tentative agreement on price and may announce an accord as soon as this month, said the people, who asked not to be identified as the discussions are confidential. Fiat and KKR are negotiating a valuation of more than 5.5 billion euros ($6.3 billion) including debt, they said. The transaction could exclude small parts of Marelli's business, such as the unit that makes plastic dashboards and bumpers, the people said. Fiat was seeking bids that value all of Marelli at 6 billion euros or more, people familiar with the matter said last month. No final decisions have been made on the price or the timing of a deal, and talks could still fall apart if the two sides fail to agree on the remaining details, the people said. Fiat may also keep its LED lighting unit, which is related to the development of autonomous driving, Corriere della Sera reported. "The plastic business relies much on Fiat and has limited profitability," Gabriele Gambarova, an analyst at Banca Akros in Milan, wrote in a research note Wednesday. "On the contrary, the led lighting business is important." A representative for Fiat declined to comment, as did KKR. KKR's Co-President Joseph Bae is on the board of Exor, which is Fiat's controlling shareholder. A combination of the two auto parts makers would create a business with more than $17 billion in annual revenue and about 65,000 workers from Tokyo to Milan. Talks initially started months ago under former CEO Sergio Marchionne, who died in July, the people said. Fiat rejected an offer last month as the two sides were divided on the price by about 1 billion euros, people familiar with the matter said at the time. The sale of Magneti Marelli would become one of the first major milestones for Fiat's new CEO Mike Manley, who took over days before Marchionne died. Marchionne, who had initially favored a separation of the business by distributing shares to investors, had said Fiat was open to changing its mind for a "big check." Without the right price, the preferred route remains the spinoff, which was approved by its board in April, the people said. Still, conditions for a Milan stock exchange listing have deteriorated in recent months as global trade tensions and profit warnings from automakers including Fiat, as well as suppliers like Continental, have eroded confidence in the industry. Volvo last month delayed plans for a share sale, saying the timing is "not optimal." Aston Martin's shares fell about 15 percent this month since its initial public offering, which was priced near the bottom of its range. Marelli's average competitor trades at about 5.3 times its earnings before interest, taxes, depreciation and amortization, according to data compiled by Bloomberg. At that valuation, Marelli would be worth close to 5.25 billion euros, the people said. Fiat wants to sell Marelli to streamline its operations and return value to shareholders. The unit could provide Fiat with more than $2 billion in dividends, according to Joel Levington, a senior credit analyst at Bloomberg Intelligence. Before embarking on talks with KKR, Fiat fielded interest from other potential buyers, including Apollo Global Management, an unnamed Asian parts supplier and Bain Capital, people familiar with the matter said in August.